Local theatre buffs and preservationists have high hopes for a new project to save the New Mission Theatre, which has been empty and languishing for over a decade. In mid-February, a Texas group called the Alamo Drafthouse Cinema , and Toby Morris of Kerman Morris Architects, made a presentation at the city’s architectural review committee for the complete restoration and rehabilitation of the old theatre. 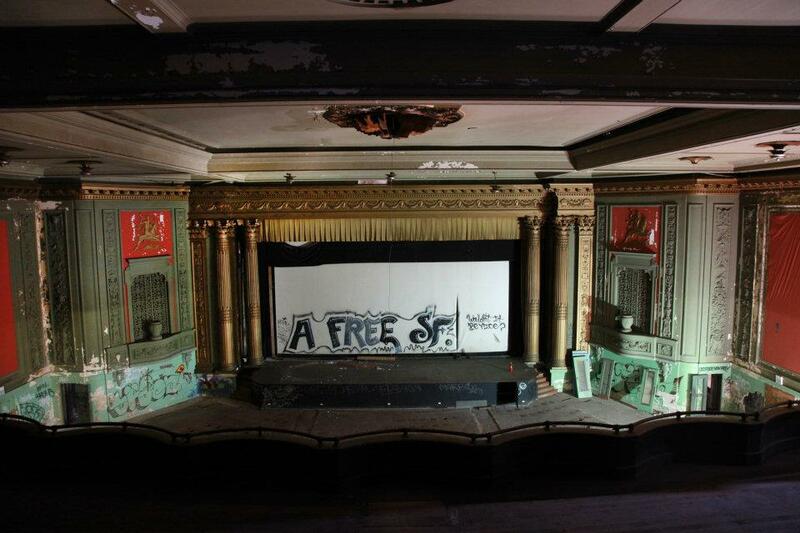 The plans would restore the space to again show movies, but Alamo wants to convert the New Mission into five “boutique” theatres, a concept that has in the past raised the hackles of many theatre buffs. Alamo Drafthouse also plans to serve higher-margin food and beer. The company is apparently an institution in Austin, where it serves snacks, food and beer to patrons, and is well known for vehemently enforcing its no texting, no talking policy. The only similar concept locally is the Kabuki Sundance Cinema, where patrons can buy beer and wine and food. An executive from Alamo Drafthouse and architect Morris were saying all the right things at the city’s meeting. “We are movie fans for movie fans,” said Tim Reed, Alamo’s senior vice president of real estate. “And when you see a gem like the [New] Mission and the ability to go in and bring it back to its heyday and the quality of what it is, it’s very, very exciting. We think what we are going to present to you today is going to be something we can all embrace,” Reed said. The New Mission is indeed a diamond hidden behind the rough, but it has also had a tortured past. It started out as a nickelodeon called the Idle Hour. In 1915, the owners hired local architects the Reid Brothers, to design a large auditorium and a new lobby, with seats for over 1,700 and a pipe organ that cost $26,000, a massive sum at the time. The theatre opened in 1916 and would become one of many theatres that brothers James and Merritt Reid designed, in addition to their major buildings at the turn of the century, such as the Spreckels Building and the Fairmont Hotel. 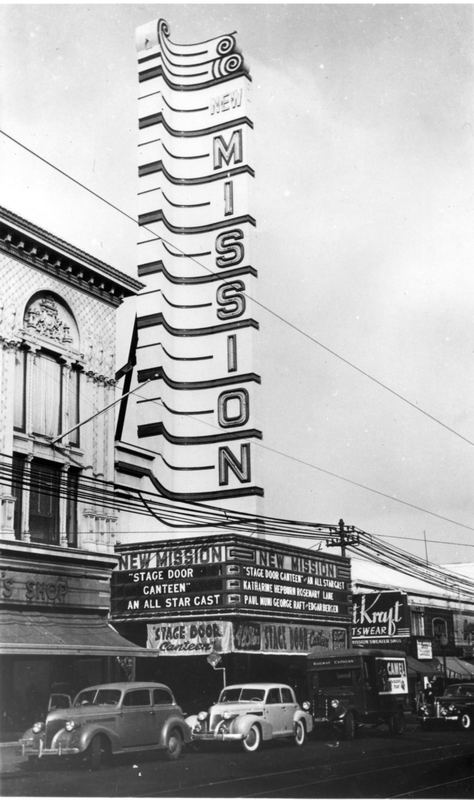 In 1932, the theatre’s owners the Nasser Brothers, who also owned the Castro and the Alhambra theatres, hired architect Tim Pflueger to modernize the New Mission, which the Reid Brothers had done in a mostly neo-classical vocabulary. Pflueger added Moderne touches to the main lobby, including some murals in silver leaf, but he mostly left the Reid Brothers auditorium alone. The most pronounced addition by Pflueger is the striking 70-foot high neon vertical, which remains today, albeit in disrepair, and a swank staircase in the main lobby (see photo below). 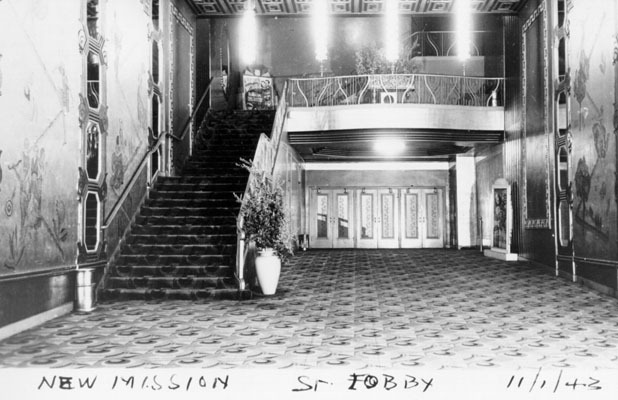 In 1993, the theatre was shuttered and in 1998, it was purchased by City College of San Francisco, with the intent to build a new campus in the Mission District. But the only token of the theatre that City College wanted to save in its plans was the striking vertical blade. It planned to tear down the theatre, and a preservation battle ensued, one that got nearly as heated as the unsuccessful fight in the 1970s to save the City of Paris department store from the wrecking ball by Neiman Marcus. This time around, however, preservationists prevailed. In 2001, the theatre was named to the National Register of Historic Places. Instead of working on an adaptive reuse plan with preservationists, the college decided to sell the building and in 2003, sold it to Gus Murad, the owner of the hip rooftop bar, Medjool, in the Mission. Murad planned to turn the theatre into a performance art space, but his project also included expanding and turning the Giant Value store next door into condominiums. After both of these projects hit too many brick walls with the city, Murad is fed up with San Francisco, and reportedly, has put Medjool up for sale. The Mission Blog reported that Murad is in contract to sell the New Mission to Alamo Drafthouse, but the company is not commenting beyond a blog post by its founder and CEO Tim League and its committee comments. League posted some photos of the theatre which showed its current delapidated condition, but also showed some of its still-extant architectural features. It’s not clear how much the major project, which includes a seismic retrofit, will cost. Morris told the architectural review committee that probably the most signficant aspect of the project is a concept of a “floating balcony,” by extending the lower balcony 15 feet toward the screen. This “floating balcony” is where auditoriums 2, 3 and 4 will be located. “We are going to hold the ceiling of the theatre off of the existing historic ceiling to preserve the interior volume and spatial relationships and to enable visibility of the historic ceiling,” Morris said. Auditorium 5 will be located on the upper balcony, and the domed ceiling will remain intact. A kitchen and new restrooms will be added on the ground floor. The plans include keeping and restoring as many of the historic details as possible, such as the Reid Brothers’ ornate plaster work. Where features cannot be saved or restored, molds will be made to help the architects and builders recreate the work. Sadly, the Pflueger lobby, also described as the promenade lobby, was described as needing “reconstruction” because of water damage and brick walls which have to be reinforced. The lobby is the oldest part of the building, and the Reid Brothers auditorium is at least made of reinforced concrete. The goal is to save as many of the mural fragments as possible and display them in the Pflueger lobby, possibly in their original location. Katherine Petrin, an architectural historian at Architectural Resources Group who is also on the board of the San Francisco Neighborhood Theatre Foundation, said the proposed project is “a rehabilitation that is very exciting.” “The San Francisco Neighborhood Theater Foundation is in full support,” she said, adding that ARG is the historical consultant to Morris and had been working on various projects to restore the theatre for years. As Morris noted in his presentation, “the devil is in the details,” and there may be some obstacles bedeviling this project. Theatre historian and author Jack Tillmany is not as sanguine about the prospects for the New Mission, nor for ACT”s plans to renovate the old Strand Theatre in the Mid-Market area. But, it would seem that the gritty location of the New Mission is a good fit for the Alamo Drafthouse, which started its first theatre in a warehouse district in Austin, Texas. League brings hope in his blog, noting that he was born in Berkeley, and that San Francisco is his favorite city in the world. “We still have many permitting and planning hurdles ahead of us, so we don’t have even a target date to get this done,” League said. Gary thanks for pointing out the latest spam comment! Got rid of it. Thanks for such a detailed and enlightening article about the work, hurdles and more of this newest theater project. Thanks also to Gary Lee for the additional info.